Replacing a lost tooth with a dental implant will preventing the collapse of the surrounding teeth. 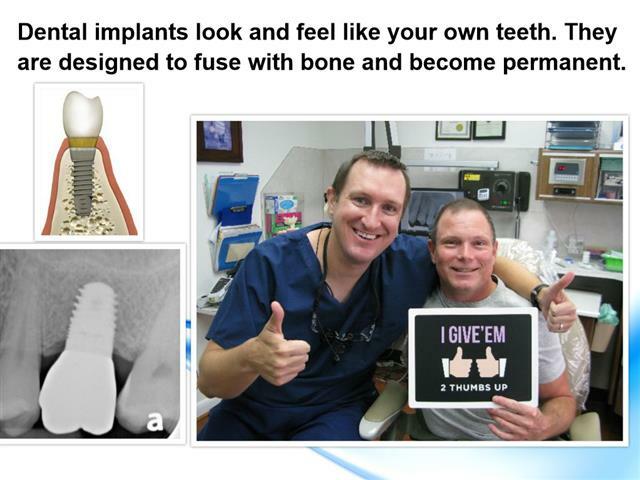 Plus, implants prevent gum/bone tissue loss. The implant is placed into the jawbone. Over the course of a couple of months the bone fuses with the titanium dental implant. Then the abutment and porcelain crown are placed on top of the implant. Dental implants do not damage adjacent teeth like bridges or partial dentures. Get the best in dental implant care. When you have a missing tooth, it is crucial to that tooth. Your teeth work in unison. When one is missing a tooth, your chewing and eating can change. This can alter your bite and cause jaw pain. Furthermore, when a tooth is lost the other teeth with collapse into the empty space. The jaw bone will collapse and the bone will disappear. The absolute best way to replace your missing teeth is with a dental implant. A dental implant is a new tooth made of titanium and porcelain that replicates a natural tooth. The dental implant looks and feels just like your natural teeth. A dental implant is composed of three different parts. 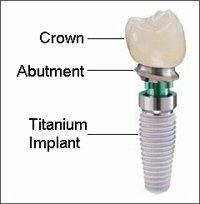 Abutment – Serves as the base and is screwed into the implant and will be the base that supports the crown. Crown– Replaces the top portion of the tooth. In addition to replacing individual teeth, dental implants can be used to anchor dentures. Dental implant dentures are the new standard of care. Old fashioned dentures are loose and unstable. However, with dental implant dentures the dentures “snap” onto the implant creating a stable implant denture.